A grant from the Hansen Foundation supported the Rhinoceros Project, designed to: 1) Provide a community-building art experience 2) Generate conversations around global issues 3) Create meaningful connections between art, history, science, and environmental stewardship. The project included sewing circles. Conversations at the circles varied from art topics to the plight of the endangered rhinos to personal histories and stories. Being able to have these discussions in a safe and welcoming environment helps to build empathy and community. The collaboration with the Zoo was beneficial for both organizations. Since the Rhinoceros Project focuses on drawing attention to the extinction of rhinos, and preservation of wildlife is part of the Zoo’s mission, this partnership was a logical fit. Our sewing circle at the Zoo was set up at the rhino barns, and there was a lot of interacting with the rhinos. 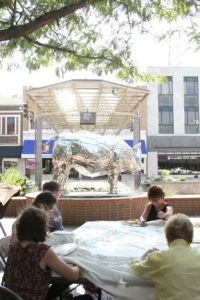 For our downtown sewing circle, we set up by “Harley”, the rhinoceros sculpture in the Downtown Sculpture Walk. We were able to bring people to the sculpture and draw attention to the sculpture walk.